You can count the number of soccer teams in the world better than Borussia Dortmund on one hand. Last season, the German club struggled with the loss of Robert Lewandowski and the impending loss of Jürgen Klopp and wound up with a sorry seventh-place league finish. One year later and they are back amongst the best of the best. Pierre-Emerick Aubameyang, Henrikh Mkhitarayan, and Marco Reus have coalesced into one of the scariest attacking trios in Europe, and the club has scored as many league goals as Bayern this year. Behind them, İlkay Gündoğan and Shinji Kagawa pull strings as well as anyone in Germany. In yesterday’s Revierderby against Schalke, Kagawa was the lone member of that front five to start. Alongside him was 17-year old American Christian Pulisic, who made his second Bundesliga start and was Dortmund’s second-best attacking player on the day. 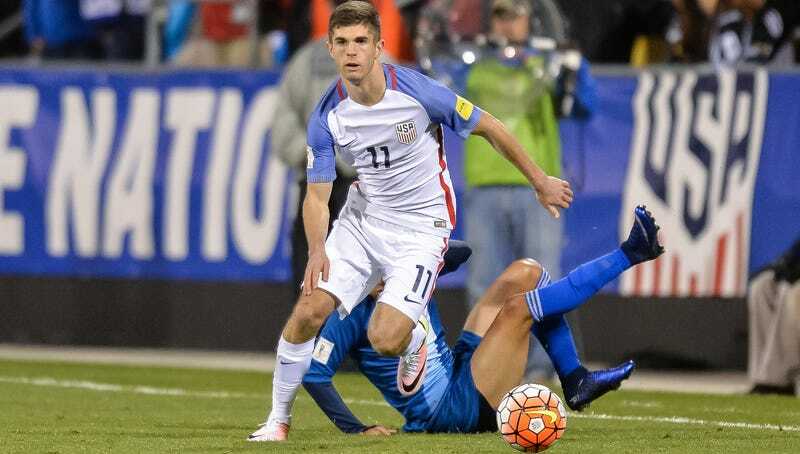 As an American teenager with a Croatian passport who’s now cap-tied to the USMNT, Pulisic comes with all sorts of symbolic baggage about big, serious topics like the Future Of American Soccer and How We Develop Players Now. Those tentpoles and the speculation about the future are all important, yes, but here is a thing Pulisic did yesterday. Which is to say Pulisic, right this minute, might be the best creative attacker we Americans have to offer, and his ability to conjure scoring opportunities for others and play as a dynamic attacking midfielder brings a genuinely new dimension to the fore. The most successful American players tend to be fit, yet somewhat static players. They move forward, backward, and side to side as well as anyone, but those movements at hidden angles that only the deadliest attackers are able to drift along exist on a plane your average American is entirely oblivious to. Michael Bradley runs and gets to the right positions, but he’s short of smashing his way through, he’s completely unequipped to unlock entrenched defenses as a No. 10. The creative players in the pool are all either converted forwards (Clint Dempsey), out of position (Bradley), or not that good (Lee Nguyen). Whether or not Jürgen Klinsmann’s years-old proclamations about the United States playing beautiful poetic soccer is a worthwhile ideal, Pulisic is the type of player who theoretically makes it possible. And he was tremendous in the derby. Pulisic is one of those rare players who somehow gets faster with the ball at his feet. He used that quickness and his impressive dribbling skills to lure defenders in, and either slipping away from the pressure with a series of sneaky little turns and flicks or baiting the poor soul opposite him into a foul. He’s not yet the finished article by any means, but he’s already shown that he belongs out there against one of the best teams in Germany. He’s a teenager in his first year of professional football. His first two games in the starting eleven were in Leverkusen and here today in Schalke - not the easiest of tasks. It shows our huge appreciation that we see him as a full time player on our team. He was a valuable substitute against Werder Bremen and Liverpool. He has looked really good recently which has been proved today. It is completely normal that he could not have played with this pace and this intensity for over 90 minutes. This is the thing that’s easy to lose in all the hype about him as a prospect and all the worry about all the hype about him as a prospect: Pulisic is a much more defined quantity than previous Great American Hopes who came before him. Julian Green was a 19-year old with a shiny rep burnished by the often exaggeratedly complementary Pep Guardiola and without a single league appearance. Freddy Adu played in the Champions League for Benfica but never integrated himself into the club structure there or anywhere else. Pulisic’s closest analog is Landon Donovan, but Pulisic already has almost as many first-team appearances at Dortmund as Donovan did at Bayer Leverkusen, and Dortmund are a better team. None of which is to say it’s a certainty that Pulisic becomes a mega-star. Young starlets crash and burn all the time. He is, however, charting untested waters, as no American field player has broken through at an elite European academy and made it to the first team. During the Julian Green recruitment that preceded the 2014 World Cup, his status as a Bayern Munich youth player supposedly served as proof that he was legit. But big clubs like Bayern churn through hundreds of prospects who never sniff the first team and they buy ready-made replacements every summer. Gedion Zelalem is another player of this ilk, though on a little firmer ground to realize his potential. While his flirtations with Arsenal’s first team are exciting and important, there’s still a world of uncertainty as to whether he can hack it. Finding a club with a proven track record of developing, then implementing academy kids, and hoping those clubs are interested in American players is probably as important to ensuring a player’s fully-maximized future in the sport as is his latent potential. In this way, Dortmund is sort of a perfect place for Pulisic to develop; they’ve always heavily prioritized taking the gems polished in the academy and embedding them into the first team. Pulisic is also a particularly interesting test case because he was only involved with the mainstream apparatus of American soccer development early on. He played for the Pennsylvania Classics, then the USA U-14's, then had a short stint at the U.S. Soccer Bradenton Academy. His Croatian passport allowed him to move to Germany shortly after, but without that handy E.U. passport allowing a swift move to Europe, it’s unclear what a counterfactual, non-Croatian Pulisic would have done next. He could have signed a Generation Adidas deal with MLS and gone through the draft or perhaps signed as a homegrown player with the Philadelphia Union. He could have braved the no man’s land of college soccer. He could have tried to obtain a work permit and seek refuge with whatever European team wanted to sign him and deal with all the attendant paperwork. Pulisic could still have developed into a star in any of these scenarios. But that road would have been far more treacherous (before you even get to the quality of training he would have received), and he’d have to wait until he was at least Matt Miazga’s age to try and make the leap to Europe. For MLS and the USMNT to get were they want, at minimum the league must serve as a functioning incubator of talent, where young players can fight for first team minutes there rather than toiling away at the demonstrably ineffectual youth team and college systems. Players like Pulisic, Green, and Zelalem will always be at an advantage over non-dual-citizens because they get to plug into a European system of talent development. Word to Ben Lederman. Miazga might be a more revealing test case since he came up through MLS, but Pulisic’s short circuiting of the whole thing and going straight into Dortmund’s first team at 17 is far more impressive. There is no guarantee Pulisic going to turn into Lionel Messi or anything nearly that hyperbolic, but he’ll probably play in the Champions League before he’s of voting age, while his American contemporaries are picking which Big 10 school they’ll attend to compete against players who could never even make it into a Champions League club’s reserve team. The history of the USMNT is filled with failed saviors. Fans are wary of any messianic proclamations, and rightly so. But for whatever kind of player Pulisic will or won’t become in a few years, the player he is right now is really damn good, and the direction of his trajectory should only make him better.